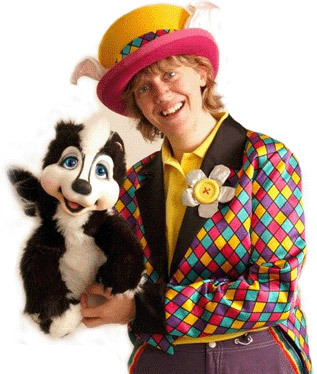 Mel is a Children’s Party Entertainer based in Hertfordshire. Shows are available for All occasions from Popular Birthday parties, ages usually 3yrs upwards, Weddings during the speeches, schools, fetes and Fun days, Christmas Parties, Teddy Bear Picnics, End of term, Christenings, Graduation parties and many more. The 1hr includes Fun, Magic, Lots of audience participation, Juggling and plate spinning, Balloon model for the birthday boy/girl, and a live rabbit! The birthday child will be the magical helper through out with help from their friends. This would include the above 1hr magic show, a break for tea (approx. 20mins), followed by games, competitions, music and dancing with all the sweets and prizes included. You would just need to provide the tea! Playgroups From a 30/45mins-1hr Fun Colourful magic shows for playgroups. Colourful Magic that is fun for them to watch and lots of silliness! Could be at your Playgroups graduation parties, teddy bears picnics, Christmas parties. Fun Days – 30 minute shows: Ideal for carnival and fetes. 2hrs could include 2x 30min shows and mix n’ mingling. * Balloon models are available on request. (please enquire for prices and number of balloons required). Book a “MELS MAGICAL Party” today! ‘Ashleigh M’ – We hired Mel for our son’s 4th Birthday party and I couldn’t be any more pleased with how it went. The ability to keep over 30 3 and 4 year olds engaged for an hour and a half is fantastic talent and it was so enjoyable for all of the kids (and the adults had a great time too!). Mel offers such a great variety of activities for the kids alongside the magic show and it really captures their interest. I will certainly be using Mel’s Magic again and recommending her to mums everywhere. Fabulous party entertainer and excellent value for money… completely exceeded my expectations! Thanks Mel!